Perhaps it’s a small light on the dash. Other vehicles emit the dreaded, attention-grabbing tone. Older models may just quietly sneak into the red zone. However, all vehicles are equipped with that pesky needle pointing ominously to “E.” We’re talking about the “Low Fuel” warning. You know you have been there, heck we all have. During a busy day, it’s easy to neglect that stop for a fill-up. Often times, we think it can wait: “Oh, I can go another 50 miles, easy,” we think. Maybe yes, maybe no. Are you a gambler? 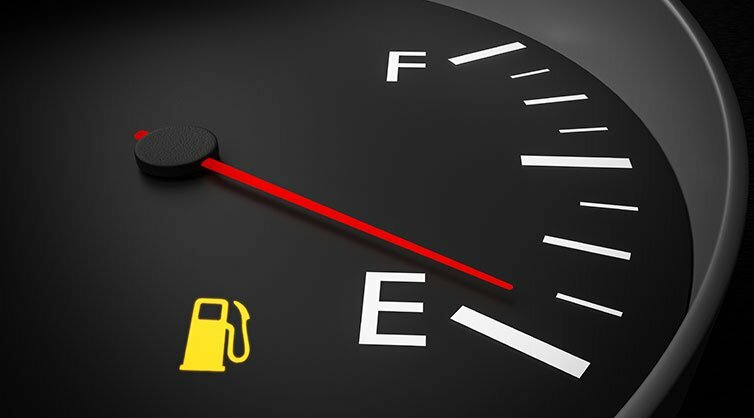 The truth of the matter is some mechanics say you should always keep your fuel tank at a quarter tank-full minimum! Why you ask? Quite simply put, it’s hard on your fuel pump. Your vehicle’s fuel pump is submerged with fuel, and that keeps it cool. Letting it work out in the open air can cause overheating and an expensive repair. You wouldn’t wear a sweat suit and parka to jog on a 100 degree day, would you? We’re not the first to ponder this subject, nor the first to test the limitations of the inevitable low fuel indicator. Your Mechanic did the research and they found that the distance you can go with the fuel warning on varies immensely. For instance, a Ford Escape’s or Transit’s light comes on with 1/16th of a gallon left and it can keep on going another 35-80 miles. A Chrysler 200 beeps at you with three gallons left and will get you up to another 108 miles down the road. By contrast, a low-fuel indicator in the Hyundai Elantra means business: you’ve got 30 miles to find a gas station. Feeling lucky? Ignore that pesky low fuel indicator. Want to avoid a visit to the mechanic or a long walk on a dark night to the nearest pump – keep your tank a quarter of the way full! Don’t be a fool and ignore the fuel. If you need quality collision repairs, call us at 419.841.2525 or stop by the shop Monday through Friday between 8am to 5pm, 7939 West Central Avenue, Toledo, OH. We have been at our location for 43 years! Central Collision is a State of the Art collision repair facility servicing NW Ohio and SE Michigan. Central Collision was established in 1975 and specializes in Collision Repair, Custom Paint Matching, Unibody and Frame Straightening and Light Mechanical RepairsWe have been at our location for 43 years! Central Collision is a state-of-the-art collision repair facility servicing Northwest Ohio and Southeast Michigan. Central Collision was established in 1975 and specializes in collision repair, custom paint matching, unibody and frame straightening and Light Mechanical Repairs.